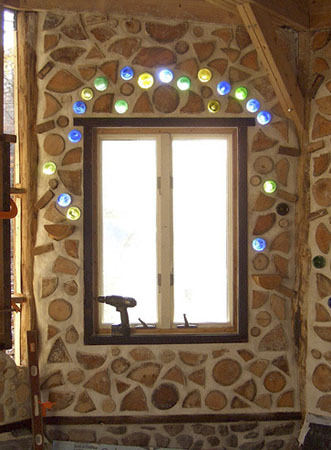 Introducing the Bottle Wall, a peculiar form of stained glass. 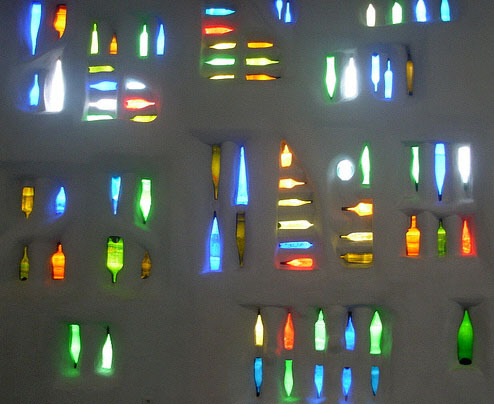 You won't see any mention of bottle walls or bottle houses in the stately and academic tomes of stained glass history. 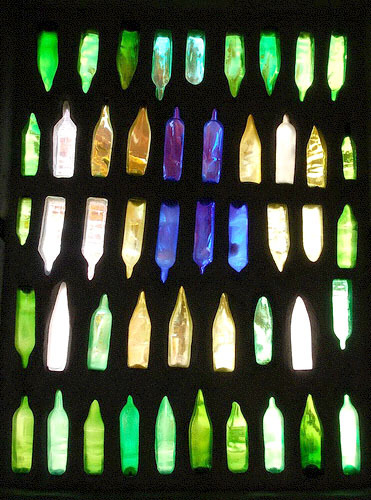 But stained glass it is, and it deserves recognition. 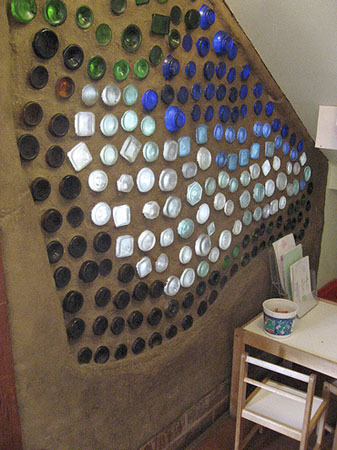 I became interested in the bottle wall phenomenon most recently through a TV show. 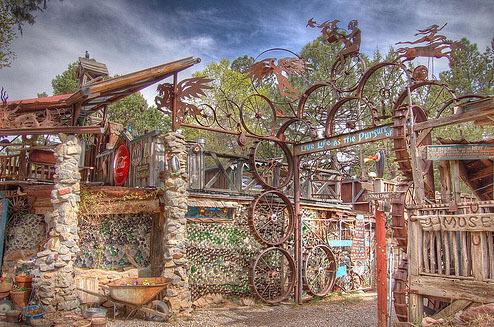 Rare Visions & Roadside Revelations is a program exploring outsider art and roadside attractions. It's produced out of Kansas City and so far over 60 shows have been produced in about 10 years. 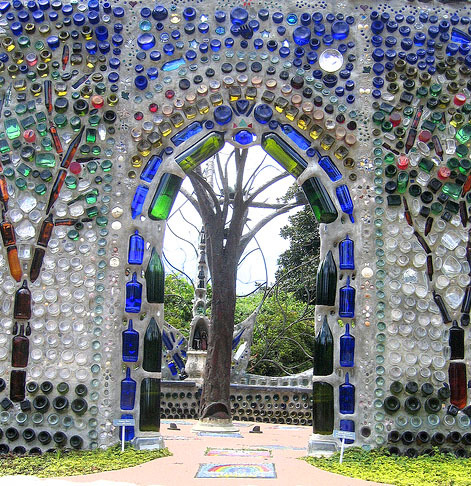 The tone of the show can be fairly described as goofy, but the art that is shown is often amazing and always interesting, and they have visited many sites with bottle walls and bottle houses. So I started researching. I don't claim to be an historian, so this will be brief. 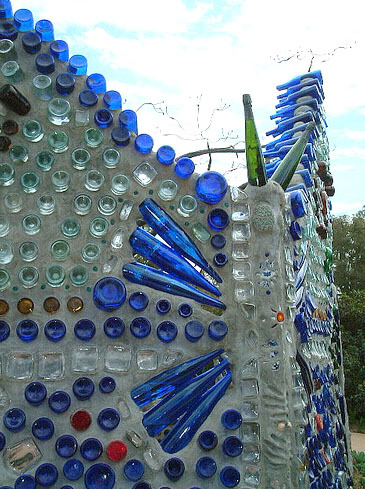 You will find much more information in the bottle house section of Debra Jane's website on Roadside Attractions. 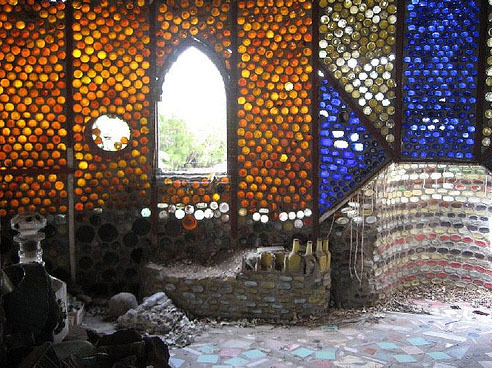 Bottle houses began as a practical necessity. 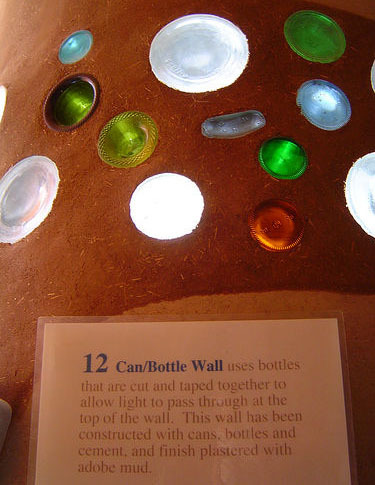 In remote mining towns where building materials were scarce, someone got the idea of using bottles as a material for building the walls of a house. 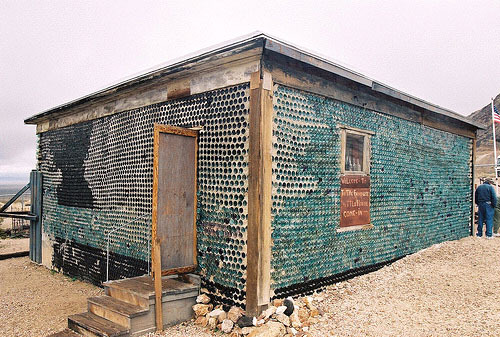 Such was the case with one of the most famous early Bottle Houses, the Kelly Bottle House in the gold mining town of Rhyolite, Nevada. Because it was located in the desert there were almost no trees, hence no wood. 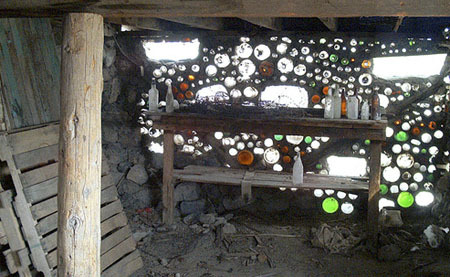 But being a mining town there were 50 bars in close proximity, hence lots of empty bottles. 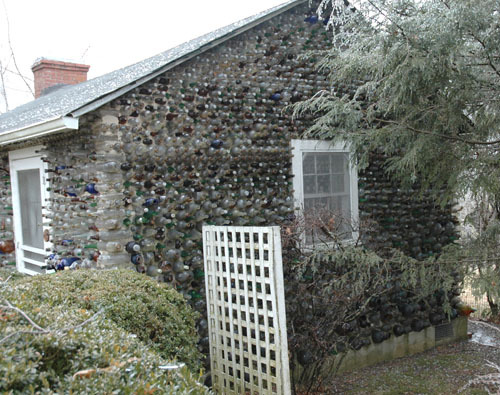 The look of these early bottle houses tended to be more mundane, owing to their utilitarian origins. 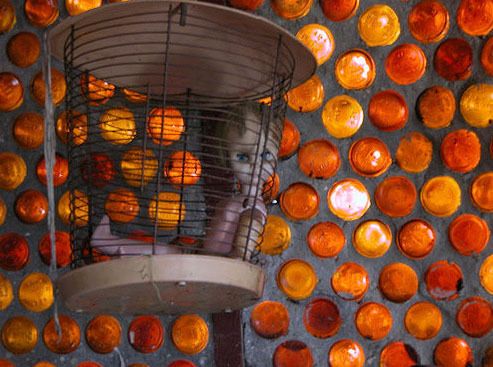 By the middle of the 20th century there was a little more 'art' put into the structures and the motivations were more eccentric and personal, such as in this house built as a playhouse. 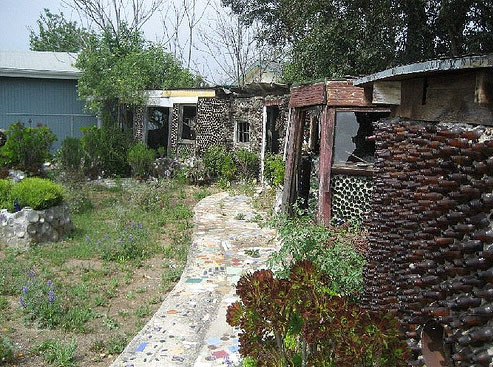 Grandma Prisbrey's Bottle Village in Simi Valley, California was created from 1956 to 1980 and features a series of 13 sheds and other small structures on a small lot of land in Simi Valley, California. 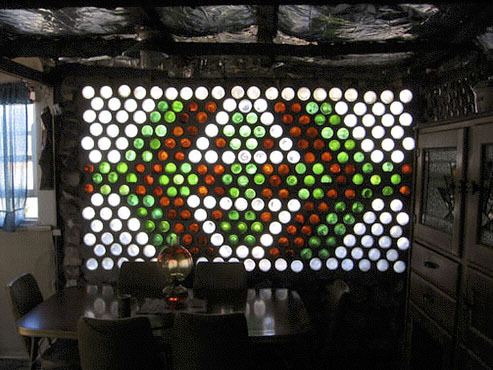 Though she originally made these structures to house her collection of pencils (17,000 of them! 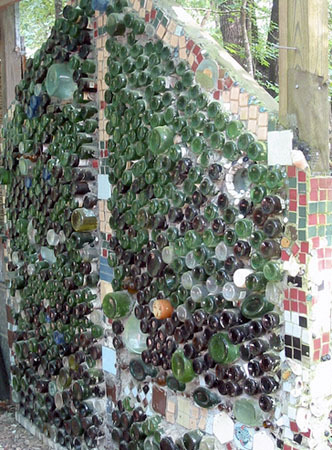 ), Grandma Prisbrey really went wild with Bottle Village, well beyond utility. 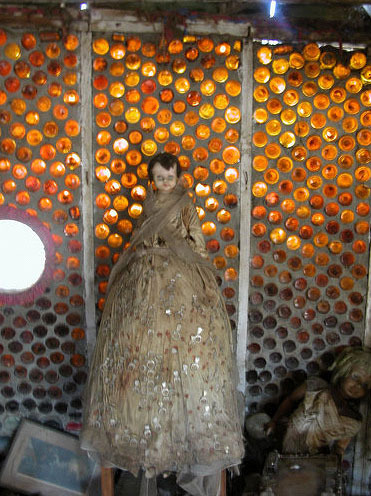 She also had a collection of dolls. Note the beverage tab decoration of the dress. 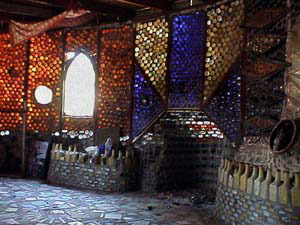 Sadly, much of Bottle Village was destroyed in an earthquake in 1994 and its future remains uncertain. 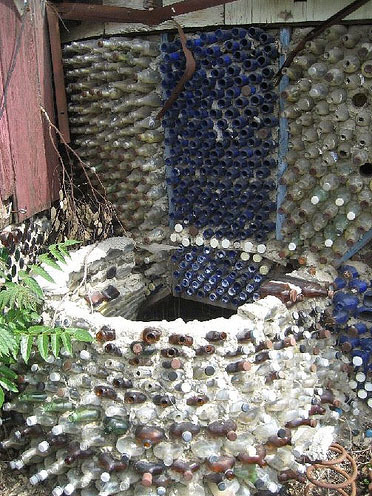 Grandma Prisbrey directly inspired other people to create their own bottle houses. 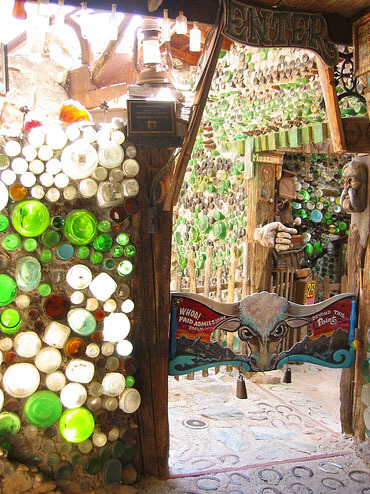 Ross Ward was one who saw Bottle Village in the 60's and then went on to create Tinkertown near Albuquerque, New Mexico. 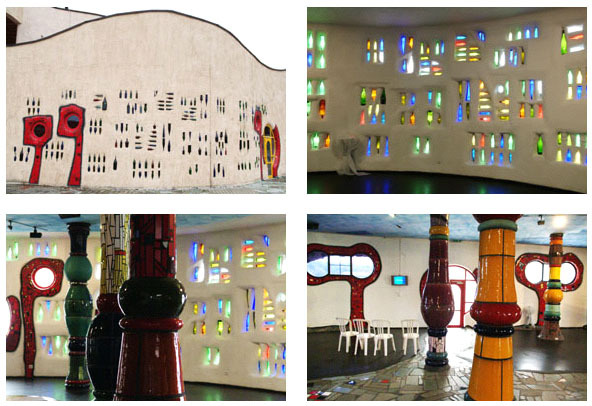 The buildings house a museum of his handcarved figures and animated scenes. 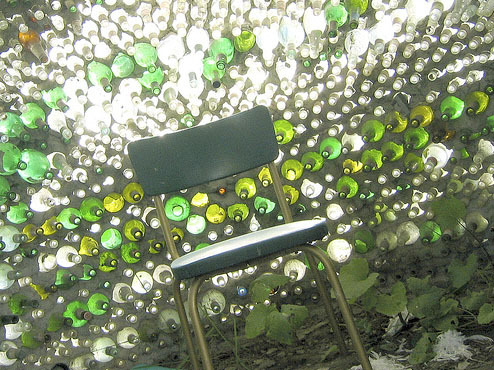 A sampling of mostly American and mostly anonymous bottle walls. 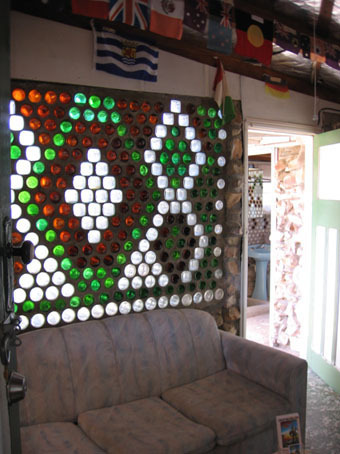 This only said "at a food coop". 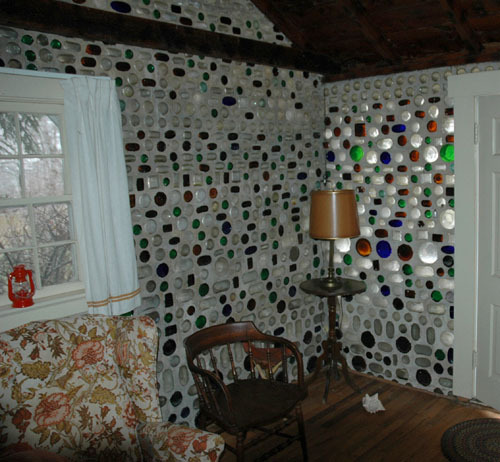 As a small feature in a house, anonymous, in the southwest I would guess. 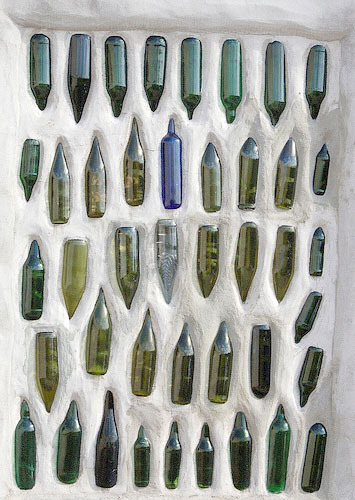 Most bottle walls, especially the garden walls, tend to be rough and messy looking with a kind of improvised mad patchwork quality to them, with no sense of pre-design. This is another wild one, a wall by an arts center in Deep Ellum in the Dallas area of Texas. I couldn't find the backstory. 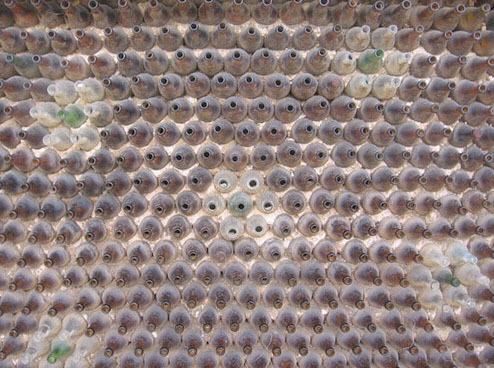 Yet some walls are quite neat and precise. 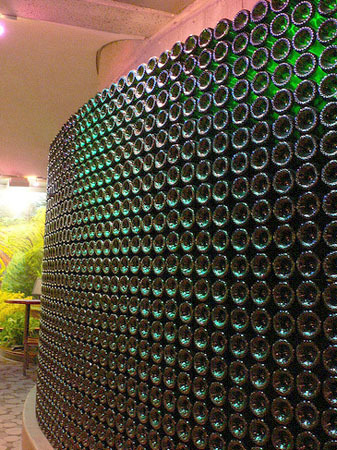 These are often seen in the more commercial or officially public settings, like this from a Napa Valley Winery. 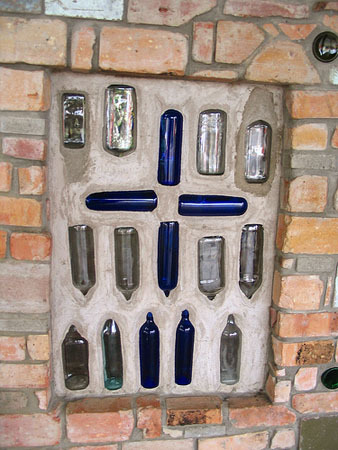 The 'neat' walls also tend to forego the use of cement as a matrix for holding the bottles together. 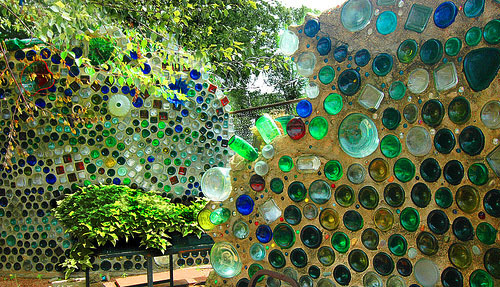 Bottle walls and bottle houses seem to be mostly, but not entirely, an American phenomenon. 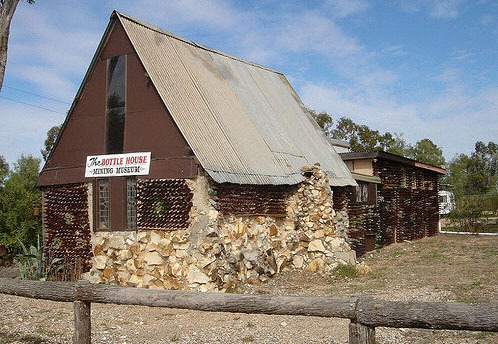 One striking case outside the USA is in Lightning Ridge, in the outback of Australia. 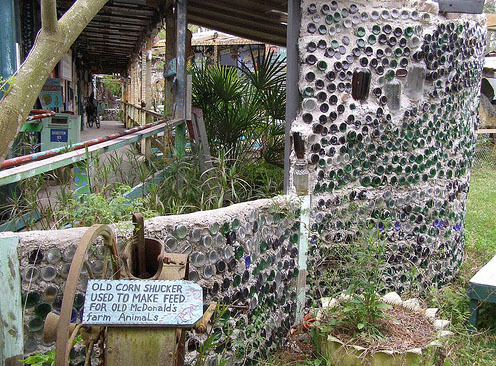 It's an opal mining town that has two bottle house attractions to its credit. 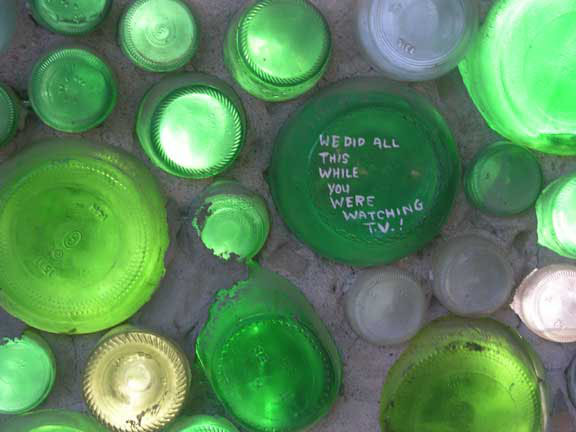 And a closer exterior shot, showing the bottles, which appear to make a specific pattern. 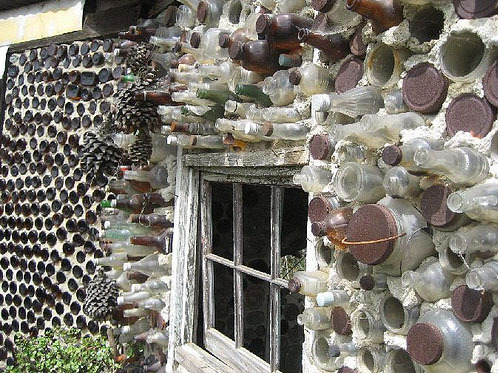 The interior seems to be closed, which is pretty common in older bottle houses. Note that there does seem to be some kind of rough pattern going one here. 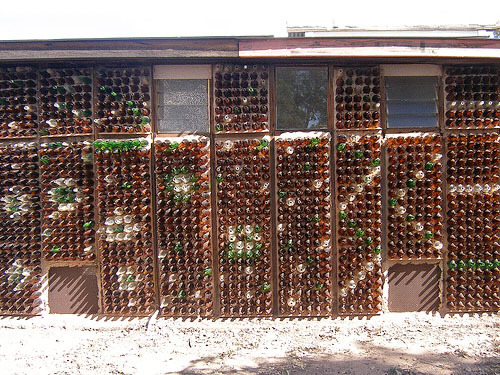 The other site in Lightning Ridge was started in the 70's when John and Joan Andrews created three sandstone cottages incorporating bottle walls. It's now a tourist attraction called Black Queen. 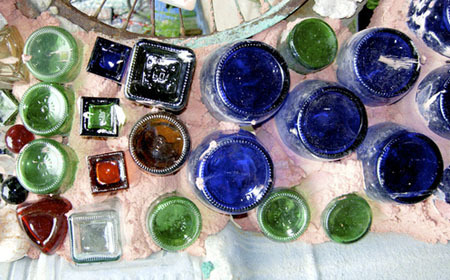 The name 'Black Queen' refers to the name of the type of black opal mined in Lightning Ridge. 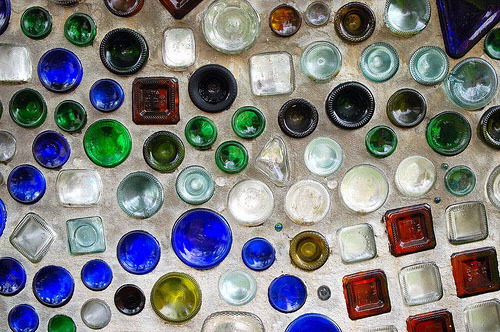 The most striking feature of the Black Queen Bottle Walls (and the sites say that there are some 34 of them) are the intricately designed patterns. 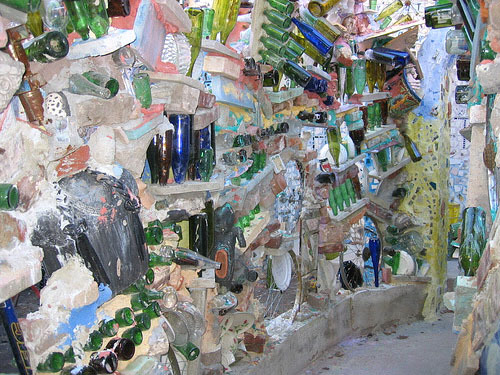 Isaiah Zagar in Philadelphia is a muralist who also incorporates bottles into walls. 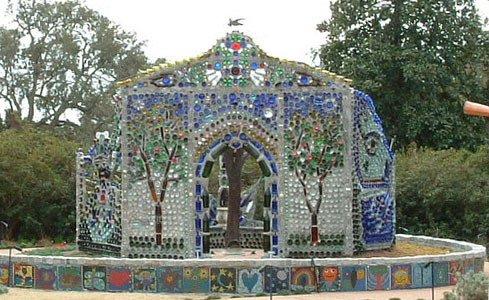 His major creation is the Magic Gardens. 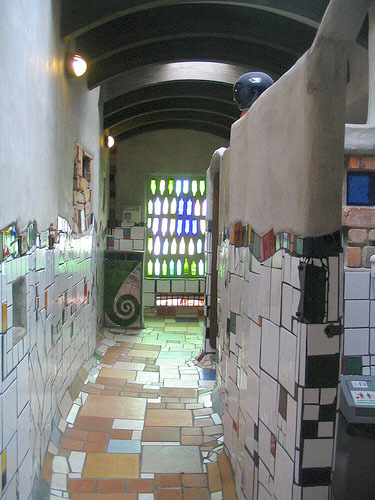 Aptly described as the most photographed toilet in New Zealand, the Kawakawa, New Zealand Public Toilet , built by the Austrian artist and architect Friedensreich Hundertwasser (1928-2000), is a rare instance of a professional architect making a bottle wall. 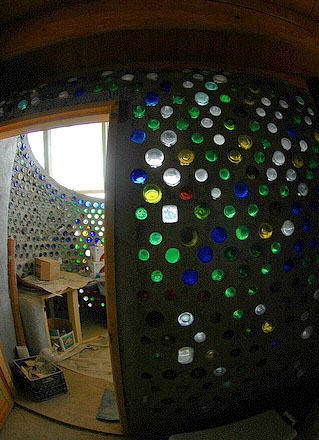 Hundertwasser, at the end of his life, lived in New Zealand and this was among his final projects. 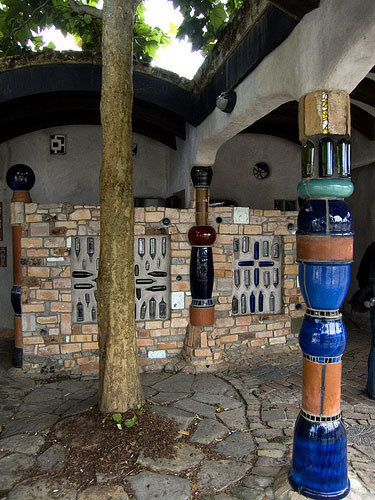 More Hundertwasser architecture images can be seen on the Fickr group called 100wasser. 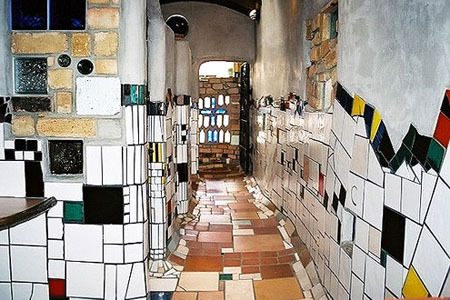 You can believe from these images that Hundertwasser was the man who said "criminal is the use of ruler and T-square in architecture" and "This jungle of straight lines, which is entangling us more and more like inmates in a prison, must be cleared." 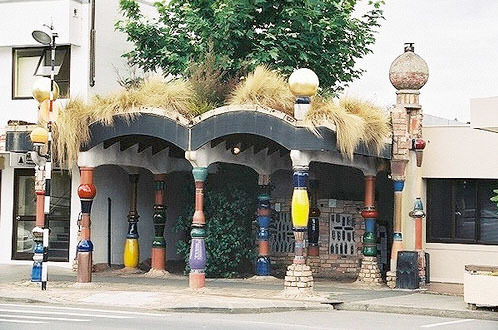 There is also, finally, this building called the Market Hall in Altenrhein, Switzerland that was done 'in the concept of Hundertwasser' not long after his death in 2000.